MamaBreak: POPSUGAR Must Have Box July 2015 Spoilers & Coupon Code! 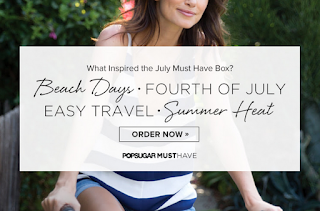 POPSUGAR Must Have Box July 2015 Spoilers & Coupon Code! There are now TWO spoilers out for the PopSugar Must Have July 2015 box!!! But before I get to those, let’s check out the inspiration behind the July box! Beach Days. Fourth of July. Easy Travel. Summer Heat. I LOVE this theme! I live in Florida, so you would think that I start to get tired of anything summer or beach-related arriving in my subscription boxes, but I don’t! It’s basically summer for 10 months of the year where I live. I’m able to use most of these “summer” items practically year round, so I love them! Every July Must Have box includes this perfect pouch to store away all your travel and on-the-go necessities! I hadn’t heard of this brand before the spoiler came out, but now that I’ve learned more about it, I’ve found that it’s a high end brand and is very popular! It looks like the product that we’ll be receiving is brown and white striped with royal blue accents on the tag and wristlet strap and also blue lining inside. AND guess what…it’s just one of SEVEN products inside the July box!!! That’s right! Typically, we see 5-6 products in a POPSUGAR box, but this month we will see 7! Every July Must Have box includes this 3-in-1 Refreshing Mist! I LOVE Supergoop products, so I am really excited to try this one out! I just started using a makeup setting spray for the very first time a couple of weeks ago (L'Oréal Infallible Pro-Spray & Set Makeup Extender Setting Spray from the Spring Target Beauty Box), so can’t wait to try out a new one! I’m really excited that this one is more than just a setting mist and also includes SPF. Based on the price, it looks like we are getting the full 3.4 oz bottle! This really looks like it’s shaping up to be a great box! I can’t wait for it to arrive so I can get my hands on everything! I will post a full review once I receive my box. What do you think about this theme? Comment below and let me know if you think it’s going to be a good box and if you’re excited about it! If you are a new subscriber, use the coupon code “REFER5” when you checkout to get $5 off your first box! Click here to order your July PopSugar Must Have Box before they are sold out! Price: $39.95/month. POPSUGAR Editor-in-Chief Lisa Sugar curates a monthly subscription box full of fabulous surprises. The best in fashion, beauty, home, fitness, food and more are delivered straight to your door! The box includes five to six full-size products with a value of over $100. This post was a contribution from one of our readers, Samantha! Although the price tag on several jewelers may be pricey, this kind of will not signify everyday people can not spend playtime with adornment and also trend breitling replica sale. Give attention to halloween costume and also trend accent parts regarding attractiveness with fantastic rates. In line with the Merriam-Webster thesaurus, halloween costume timepieces will be "fancy timepieces replica watches uk which is typically manufactured from low-cost components as opposed to genuine rare metal, gemstones, et cetera. inches The products can include rhinestones, plastic-type jewels, or perhaps beans. Halloween costume components have been produced well-known across the 1930s simply by females which wanted to guard their particular heirlooms coming from everyday use tag heuer replica uk and also split and also achievable robbery. These kinds of parts have been built to seem just like their particular higher priced counterparts fake breitling uk in order that females can use them sometimes with out being concerned concerning shedding ttag heuer replica uk.